Is it worse to have no degree at all, or an incomplete degree on your resume. The answer lies in what you’ve been doing in the meantime. Having a bachelors degree shows employers that you can see a long-term commitment through to success. Having started but not finished a degree can signal to some employers that you lack follow-through, which is a big red flag. 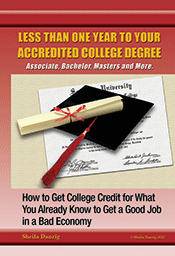 If you have incomplete college education, you may be considering going back to school to finish up that degree. Having a bachelors degree is becoming a minimum requirement for more and more jobs, gives you a leg up in the hiring process, and workers with bachelors degrees tend to make a much higher paygrade on average than workers without one. However, if you’ve been working while you’ve been out of school, and you’ve already completed some college-level courses, you may be closer to completing your bachelors degree than you think. Before you start applying for school, visit TheCareerPeople.com to learn more.